Chair: W.L. Alan Fung, M.D., Sc.D. Chair: Alexander Moreira-Almeida, M.D., Ph.D.
3) The Mental Health and Faith Community Partnership: Where Should We Go From Here? 5) Varieties of Religion and Spirituality: What Should Clinicians Know? Chair: Mary Lynn Dell, D.Min., M.D. There was strong presence of the World Psychiatric Association (WPA) at this meeting. In addition to the two symposia above chaired by Dr. Moreira Almeida (Chair, WPA Section on Religion, Spirituality and Psychiatry), three of the five presenters at the ‘Spirituality and Religion in Global Mental Health’ symposium have held various leadership roles at the WPA. They include Dr. Moreira Almeida, as well as Dr. Dinesh Bhugra (WPA President) and Dr. Unaiza Niaz (Past Chair, WPA Section on Women’s Mental Health). After the Caucus meeting, several members of the Mental Health and Faith Community (MH&FC) Partnership Steering Committee had a meeting with Former U.S. Congressman Rep. Patrick Kennedy to discuss about how the mental health and faith communities could work together in promoting mental health. Dr. Alexander Moreira-Almeida was also in attendance, representing the WPA. The MH&FC Partnership (www.psychiatry.org/faith) is a collaboration between psychiatrists and clergy aimed at fostering a dialogue between the two fields, reducing stigma, and accounting for medical and spiritual dimensions as people seek care. The convening organizations are the American Psychiatric Association (APA), the American Psychiatric Foundation (APF) and the Interfaith Disability Advocacy Coalition (IDAC), a program of the American Association of People with Disabilities (AAPD). The Partnership was initiated in 2014 with the inaugural Partnership Steering Committee meeting held on July 11, 2014. Kennedy, who is also a member of the Steering Committee, commended the Partnership’s recent publication of the ‘Mental Health: A Guide for Faith Leaders’ as well as the ‘Quick Reference on Mental Health for Faith Leaders’ (both freely available for download from the Partnership website). Kennedy also expressed his continued support for the Partnership’s endeavors, and recommended further partnership efforts in the areas of addictions as well as mental health issues in correctional facilities. On May 19, the Inaugural APA Conference on Mental Health for Faith Leaders – with the title “Equipping Faith Leaders to Respond to Mental Health Challenges” – was held at the Tyndale Seminary, Toronto, Ontario, Canada. 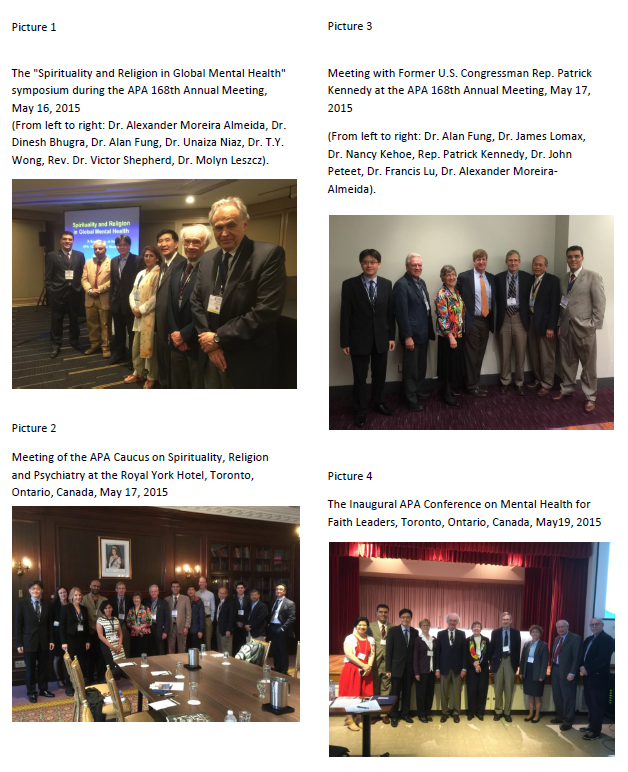 The conference was sponsored by the APA Caucus on Spirituality, Religion and Psychiatry, and locally organized by the Toronto-based Working Group for the Promotion of Mental Health in Faith Communities. The conference was conceived based on the discussions on future directions from the July2014 MH&FC Partnership Steering Committee Meeting – in terms of innovative models for enhancing the mental health and faith community partnership. The main objectives for the conference were to equip local clergy members/faith leaders with the knowledge and skills i) to provide care to those with mental health issues; ii) for faith leaders to attend to their own mental health and well-being. The conference was attended by around 100 participants from different parts of Canada – either in-person or online. The keynote speaker, Rev. Dr. Craig Rennebohm from Seattle, WA, USA, shared with the participants his ‘pearls’ for mental health ministry – based on his long-standing involvement with the Pathways to Promise initiative (www.pathways2promise.org). Other invited speakers included Dr. Mark Biddle, Dr. Mary Lynn Dell, Dr. Nancy Kehoe, Dr. John Peteet and Rev. Dr. Victor Shepherd. Dr. Alexander Moreira-Almeida served as both the special international speaker as well as the discussant. The conference was co-chaired by Dr. Alan Fung and Rev. Sheila Stevens, with Ms. Purple Yip as the lead organizer. Evaluation of the conference revealed very positive feedbacks from the participants. Planning is currently underway in making this conference an annual event – by having such a local conference on mental health for faith leaders at the city where the APA annual meeting is held – with the next conference to be held in Atlanta, GA, USA in May2016. During the APA annual meeting, various discussions were held among Dr. Moreira-Almeida and the Executive Committee members of the APA Caucus on Spirituality, Religion and Psychiatry with regards to further collaborative opportunities between the WPA and the APA in the interface between spirituality/religion and psychiatry. For instance, the MH&FC Partnership may serve as a model for enhancing such interprofessional collaborations in other countries. As well, Dr. John Peteet and Dr. Alan Fung, President and Secretary/Treasurer of the APA Caucus, respectively, are among the invited speakers at the 1st Global Meeting in Spirituality and Mental Health (supported by the WPA Section on Religion, Spirituality and Psychiatry) to be held in Brazil in November 2015. The APA Caucus looks forward to collaborating with the WPA Section as well as similar sections of other national psychiatric associations in promoting awareness of the instrumental roles of spirituality/religion in mental health care.